In ''Evening Reflections'' we can see how David Farren uses expressive brushwork and colour to represent the energy and movement of the urban landscape. 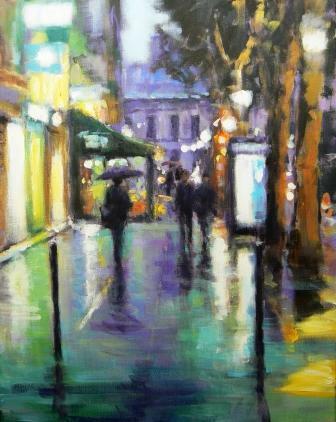 His aim is to capture the ambience and atmosphere of the city streets he observes. Light changes are represented by dramatic changing coloured shadows and reflections and the cityscape shimmers with energy and life. Farren produces his high-impact images in acrylic and oils, enjoying the immediacy and versatility of both mediums which he finds particularly well-suited to his direct, impressionistic and expressive style of painting. He is fascinated the way varied light affects a scene, and his distinctive use of colour is an essential part of reflecting this.